Streambeds act as natural water filters by trapping particles and pollutants. To better understand the dynamics of these small yet complex systems, a UNC hydrologist is creating (and clogging) her own stream. 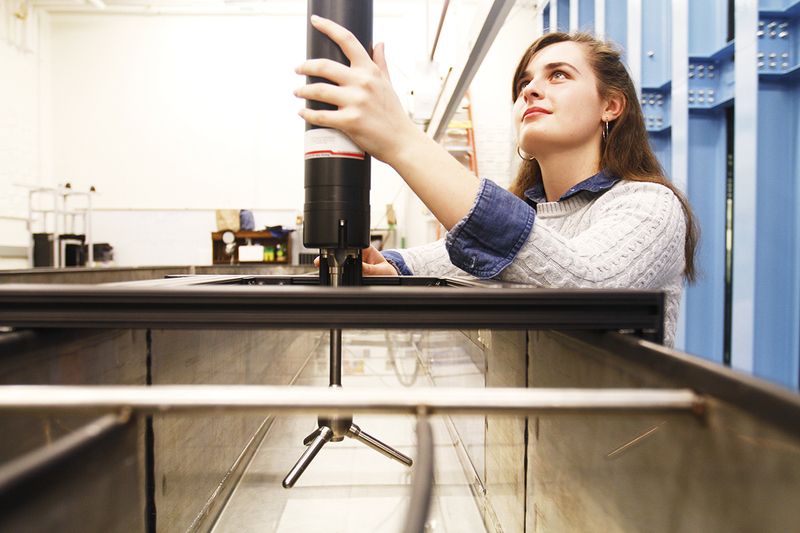 Kaylyn Gootman observes the water in the racetrack flume, as her undergraduate research assistant Savannah Swinea sets the Acoustic Doppler Velocimeter (ADV). The basement of Chapman Hall is a maze. Wind through several hallways, swipe a UNC OneCard to gain access through a heavy, locked door, and enter the massive chamber of the Joint Applied Math and Marine Sciences Fluids lab. Turn left, walk past the wind tunnel and the towering 36-meter wave tank, and you’ll see hundreds of gallons of water swirling through an elevated metal structure. Kaylyn Gootman, a PhD candidate in the Curriculum in Environment and Ecology, dumps a large plastic bag full of what looks like flour into the water and watches closely as the contents disperse. The large oval-shaped metal structure, called a racetrack flume, holds approximately 430 gallons of water, the equivalent of about eight bath tubs. Using an electric trolling motor and an Acoustic Doppler Velocimeter (ADV), Gootman can control the direction and speed of the water. The material that looks like flour is actually finely ground clay — and Gootman is very interested in how it moves. “We’re studying the physical impact of a natural pollutant — like how much clay gets embedded in a streambed — and the natural clean-up processes that the water circulation of a stream provides,” she says. Water movement is complex — in a natural stream, water flows up, down, and all around. To understand the whole system, Gootman, and her undergraduate assistant Savannah Swinea, are examining the individual processes of a stream they built here in the fluids lab. Think of a streambed as a kidney. “Kidneys filter blood, and streams filter water — both trap toxins,” Gootman says. While kidneys filter toxins like alcohol, streams break down particles from surface water runoff including pollutants from irrigation, construction, or industrial agriculture. But just as kidneys can fail, so can streams — a kidney stone is akin to a clogged streambed. Gootman’s research can help geoscientists, developers, and land owners better understand erosion events, especially as they relate to urbanization. How much pollution can a stream filter before the system gets overwhelmed? Working in the fluids lab allows her to save time and resources — and she’s not harming the environment. “Going out to a stream and dumping a bunch of clay in it would not be very good environmental stewardship,” Gootman says with a smile. 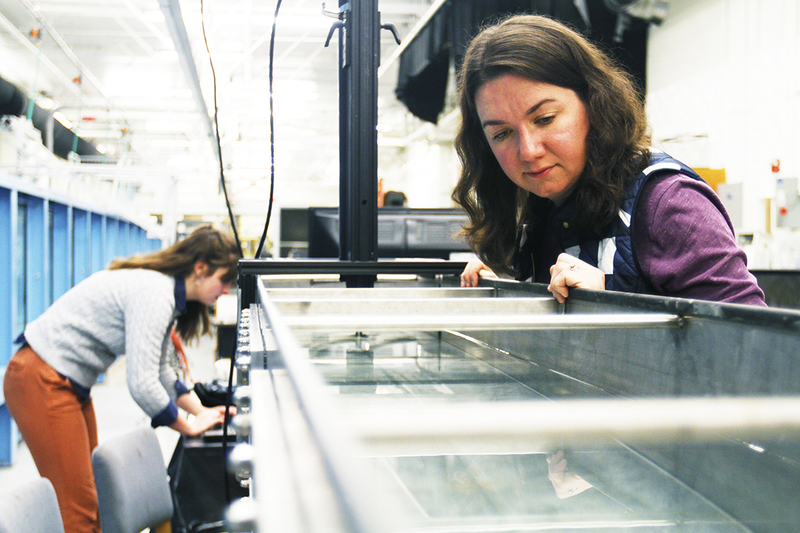 Using a contained system like the racetrack flume also gives her the ability to obtain precise measurements. She can focus on one particular direction of water movement, like down-welling, or the downward flow of water into the streambed. Examining each parameter individually simplifies the inherently complex nature of fluid dynamics. But there are other methods for measuring turbidity, including optical sensors. “Optical back scatter” is a technical term used by hydrologists that refers to the use of light to determine how much material is in a body of water. Optical backscatter sensors (OBS) emit infrared light into the water column. As soon as the light comes into contact with suspended particles, it bounces back to the sensor. Faster signals indicate more particles in the water. Gootman holds some of the sand she and Swinea use to “clog” their stream. The value of this kind of high-tech instrumentation is it records every tiny signal — the downside is it records a lot of data. On paper, it looks like a jumbled mess. “The instrumentation is so sensitive it’s almost like earthquake data,” Gootman says. To make sense of it, Gootman meets with UNC’s resident earth science data expert and chair of the Department of Geological Sciences, Jonathan Lees. “He’s helped me discern the signal from the noise,” she says. 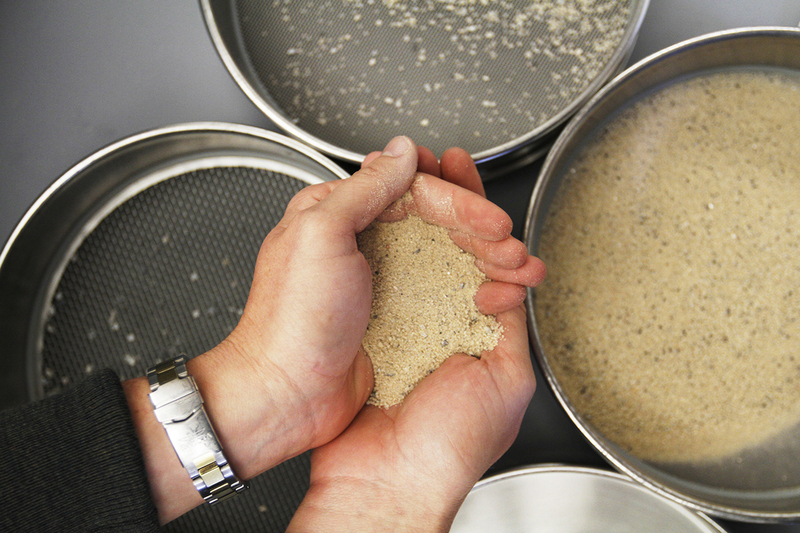 Gootman and Swinea spend hours separating the sediment cores by hand in the lab — but that only gets them so far. Fortunately, Gootman can borrow a laser particle size analyzer from Laura Moore, ­­director of the UNC Coastal Environmental Change Lab. As a junior pursuing a major in environmental science and a minor in marine science, Swinea knew she wanted to get experience with hands-on research. “I was looking for research opportunities for the summer and realized that UNC has a program for students in the geosciences from underrepresented communities,” Swinea says. The IDEA Undergraduate Research Experience, a program funded by the National Science Foundation, matched Swinea with Gootman and the two women have created a strong partnership. Swinea holds the ADV steady as Gootman begins to fill the flume with water. As Swinea contemplates the possibilities associated with a career in science, Gootman considers impact of the research they’re currently conducting together. “There are lots of things happening to our rivers and streams as housing developments and commercial developments increase,” she says. Kaylyn Gootman is a PhD candidate in the Curriculum in Environment and Ecology. Savannah Swinea is an undergraduate pursuing a major in environmental science and a minor in marine science. She was a 2017 recipient of the IDEA Program, administered by the UNC Institute for the Environment. The Joint Applied Math and Marine Sciences Fluids lab is supported by the National Science Foundation, Office of Naval Research, National Institutes of Health, and UNC College of Arts and Sciences. The racetrack flume is owned by three principal investigators, including Brian White, Rich McLaughlin, and Roberto Camassa.